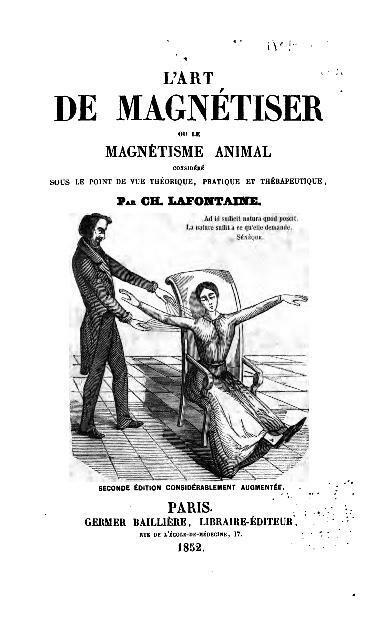 Animal magnetism was believed to be a universal force associated with the human body, and the principle behind mesmerism and its phenomena. 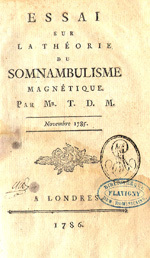 In fact, there were reports of mesmerized individuals, referred to as somnambules, who could “see” this “magnetism,” sometimes called a fluid. 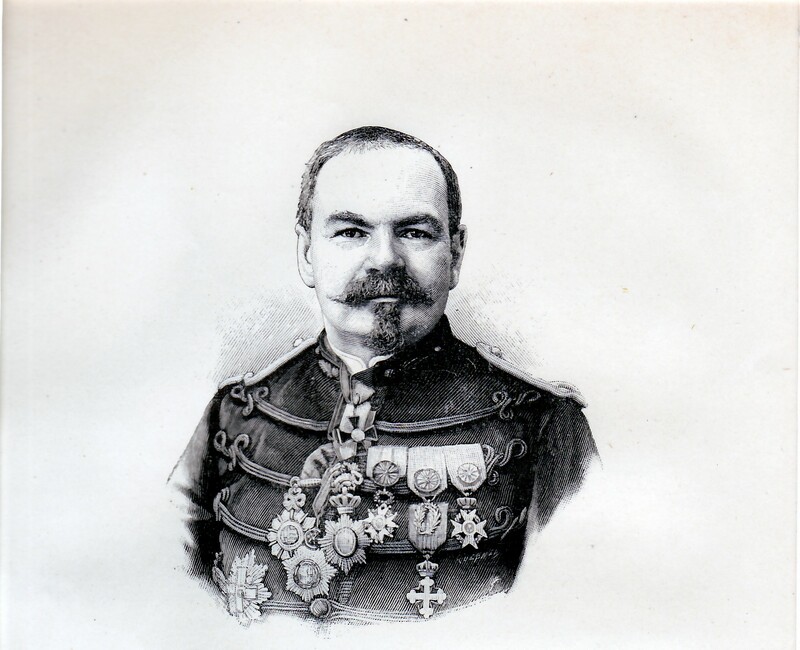 A.A. Tardy de Montravel referred to a somnambule who showed this phenomenon: “I put the thumb of my right hand in opposition to the thumb of the left hand of my patient, and separated our two hands horizontally; she saw the fluid out of her thumb & mine; she distinguished very well the two fluids . . .” (Essai sur le théorie du somnambulisme magnétique. London: N.p., 1785, pp. 27-28). “While I am drawing up her rigid arm in the waking state with her eyes free, she sees as soon as the limb begins to ascend, but not before, a colourless stream pass from it to my hand, of the same breadth as the number of the points of the fingers which I employ at the moment. Though I cover the part with a shawl, single or folded, the appearance is equal . . . If I stiffen her body and then make tractive passes from it, as soon as it advances the stream from it is seen. If I draw with both hands, there are two streams side by side from the part. The farther I stand from her, the fainter the stream appears; and, if at a great distance, there is no visible stream, nor traction. She compares it to moonlight, and it is stronger in the dark. She sees the same from my hand if I dart it at a stiffened part, but not till this begins to relax. On darting my hand at a part not rigid, there is no such appearance. In tractive passes, the stream seems to wave back towards her when my hand moves towards her again before the next tractive pass. If I breathe upon a stiffened part she sees no stream of light” (p. 225; Cure of a true cancer of the female breast with mesmerism. Zoist, 1848, 6, 213-237). Another observation came from Thomas Buckland. He wrote: “I have myself a dear relative, in the enjoyment of good health, who can, in broad daylight, see this phenomenon in her normal state. When a glass of water is mesmerised in a dark room, she perceives ‘bright little globules’ pass from the fingers and sink about half way down the water before they disappear. 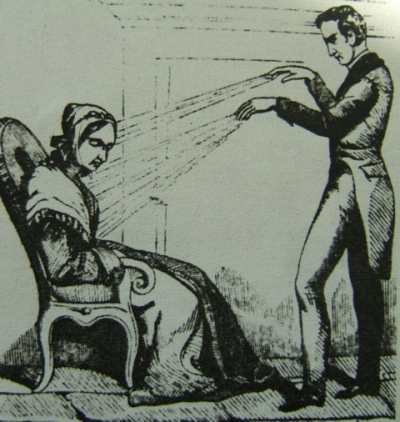 If the same passes are made over an empty glass, she perceives at the bottom of it a bluish vapour, which remains there for some time afterwards” (The Hand-Book of Mesmerism. 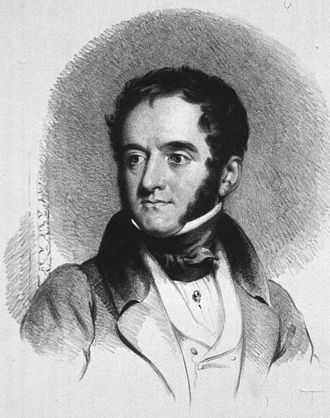 London: Hippolyte Bailliere, 1850, p. 43). These are only a few cases from the mesmeric literature. Years later similar observations were recorded in other contexts, including the work of Albert de Rochas. Such phenomena bring to mind the possibility they are related to reports of Reichenbach’s Od, the aura, and other manifestations consisting of observations of fields or emanations from the human body.